Red mullet (Mullus barbatus) “Barbounia” (Baar – BOO -nya) in Greek and their cousins, surmullets (Mullus surmuletus) “koutsomoures” in Greek, are a species of goatfish, found in the Mediterranean Sea and are considered the most delicious of smaller type of fish. The origin and etymology of mullet comes from Middle English molet, from Anglo-French mulet, from Latin mullus, from Greek melan, of dark colour. The ancient Greek word for mullet is “trigli” (trigla barbatus) and the contemporary word “barbounia” derives from the Venetian “barbon” which means greybeard. Big mullet can be grilled or baked in parchment paper but when they are small, it is best to pan fry them as soon as possible after they are caught. See detailed instructions on how to flour and fry mullet in my post for Gavros Tiganitos (fried anchovies). Before frying them they are drenched in flour and when fried they become so crispy and delicious that you will be eating everything from head to tail and licking your fingers. The only thing I hate about mullet is that they have many tiny bones but their delicious flavour always compensates. If you have leftovers, a great way to eat them is to make Savoro which is equally delicious. During the Great Lent period fish is allowed to be eaten on two occasions: on the Feast of the An­nunciation (March 25) and on Palm Sunday (one week before Easter). 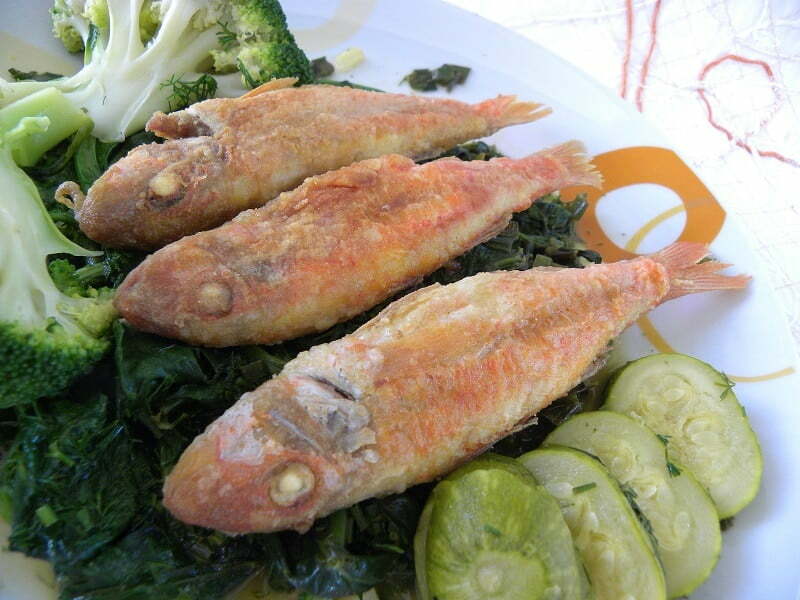 On the 25th March, it is a tradition to eat Bakaliaros Skordalia but of course you can eat whatever fish you like best. As the Palm Sunday is not far away, at end of the post I have linked some of my fish recipes for easy reference so that you don’t have to look through my blog to find other fish recipes. Warm Salads go well with fish, so when making Barbounia, I served them with sautéed spinach, broccoli and zucchini. Heat the olive oil in a non-stick 23 cm (9”) frying pan. Add the green onions and cook over fairly high heat for about 2 minutes. Add the garlic and cook until fragrant for a few seconds. Add the spinach and dill and toss to coat and cook until the spinach is wilted, about 2 minutes. Dissolve honey in orange juice and add to the spinach. Season with salt and pepper, cover with lid and cook for another 5 minutes. As when I made the mullets I served them with boiled zucchini and broccoli, it’s appropriate to tell you how I cooked them. Some times we ignore easy recipes as we think that everybody knows how to cook them but even the easies of recipes have some tricks you need to know. Each vegetable can, of course, be cooked separately but why waste time and energy when you can cook them togehter. It’s very easy to cook zucchini. The time will depend on their size. Usually a medium sized zucchini takes about ten minutes to cook. However, you need to know the right cooking time for broccoli as otherwise when overcooked you might not want to eat this wonderful vegetable again. Wash both vegetables. Cut the ends of the zucchini and trim off the broccoli florets. Do not discard the stalk, stem and leaves as they are edible and these are the ones that contain most of the valuable nutrients. The stalks of small broccoli of around 1 kilo are tender but if you have a very big broccolo and the stalk is hard you can peel the outer part. If you are cooking them together, start with the zucchini and the broccoli stalk, stems and leaves. Put them in a pot with water to coverr them and after boiling point, add some salt and reduce the heat to medium. After five minutes, check and see if a fork can penetrate the zucchini and the stalk easily. If not, continue boiling. When it does, at this point add the broccoli florets and cook for only 3 minutes. Immediately remove the florets in a bowl with cold water to stop their cooking. Drain the remaining vegetables and put them in a plate and cut them into smaller pieces. Add the florets and season with salt and add extra virgin olive oil and lemon juice. Scale and gut the fish or ask your fish monger to do it for you. Wash and drain the fish and salt them. Mix the flour with some salt and coat the fish. Shake off excess flour. Heat the olive oil, at least 1 cm (0.4”), in a non-stick frying pan and fry the fish on both sides. Do not add too many fish into the pan at the same time so that they can all get a crispy crust. When cooked place onto kitchen paper to absorb excess oil. Squeeze some lemon juice on top and serve with a salad. If you don’t want the house to smell bad after frying, wash the frying pan and insert either lemon or orange peels or whatever else you have, such as herbal tea or cinnamon sticks and boil without the cooker hood on and all the house will smell as if you have baked a cake!! Red mullet (Mullus barbatus) "Barbounia" (Baar - BOO -nya) in Greek and their cousins, surmullets (Mullus surmuletus) “koutsomoures” in Greek, are a species of goatfish, found in the Mediterranean Sea and are considered the most delicious of smaller type of fish. Ask the fish monger to scale and gut the fish, wash and salt them in a strainer. Mix the flour with some salt and coat the fish. Heat the olive oil (at least 1 cm) in a non stick frying pan and fry the fish on both sides but do not add too many fish so that they get a crispy crust. That’s a wonderful meal, Ivy. I haven’t seen those fish over here, wish I could taste some of yours..so crisp and delicious. It looks delicious! I want to eat a fish like this because it seems very good! Thanks for sharing. Im really surprised. Congratulations! Greece, so I fell in love with the cuisine. I will definitely try the fried red mullet by myself. Thanks for sharing this wonderful dish. I like this meal.